LED.... Beyond the Basics. Learn about the newest in lights, components and how to use them. This class is easy, fun and very informative. One you will use for years and in all miniature applications. The recent Seattle, WA class raved about what they learned and are looking forward to the more advanced class. 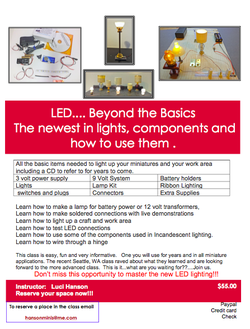 This is it... don’t miss this opportunity to master the new LED lighting!